300 counters, 1 Turning Key, and a ziplock bag to hold them. The Road of the Future Is Littered . 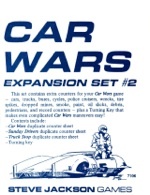 . .
Cars, trucks, buses, cycles, police cruisers, wrecks, tire spikes, dropped mines, smoke, paint, oil slicks, debris, pedestrians, and record counters – it's the extra counters you need to "decorate" the roads of your Car Wars game! 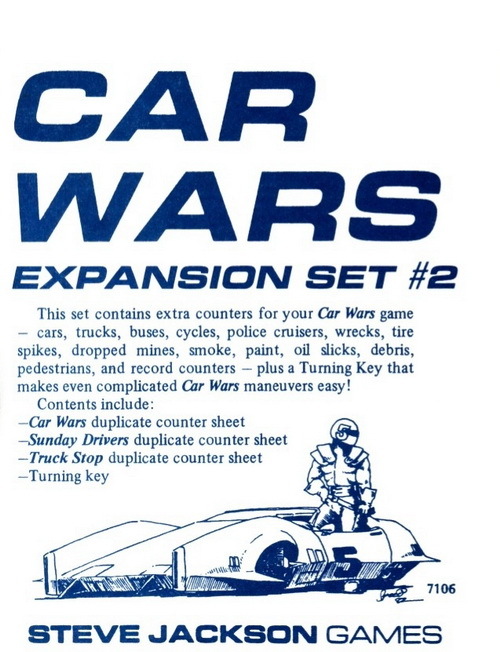 Populate or trash your streets with the counter sheets from Car Wars, Crash City, and Truck Stop, all in one set. Plus, you get a Turning Key that makes even complicated Car Wars maneuvers easy. Print one for every player!